If you ask 5 people when to travel with a baby, you’ll get 5 different answers. Different people will have widely varying opinions and experiences on when to travel with a newborn. However, five important factors we always consider are the health of the baby and the mom, what health issues are present at the destination, time of year, mode of transportation, and comfort level of the parents. Is my baby healthy enough for travel? First and foremost, you should check with your pediatrician to help decide when baby is ready for travel. This is especially important if the baby has any sort of health issues – premature delivery, difficulty breathing, etc. Even if there aren’t any specific health issues, some babies may be colicky or gassy or may not do well off of a routine. These are all things to evaluate before making a decision on travel. On top of all this, the mother should check with her doctor to ensure she’s ready for an adventure, as well! What health issues does my destination have and will medical assistance be available for my baby? It’s very different taking a baby to San Diego than it is taking a baby to Zimbabwe. Both can be wonderful (in fact, we’ve done both! ), but they require very different preparation. Be sure to check what health issues might pop up – some countries have major virus like malaria or dengue fever, others might not have drinkable tap water, and still others might require certain vaccinations for which your baby is too young. It’s up to you to decide what risks are worth taking, and to determine if medical assistance will be available should you need it. Can my baby travel during this season? Assuming all the health stuff is in order and the doctors have approved travel, the next things to consider are time of year and mode of transportation. Are you comfortable traveling during cold and flu season? Are you traveling somewhere really hot or cold for a baby? For us, we’ve found that while babies are more susceptible to illness, we usually wear our babies in a carrier, so they stay pretty close and don’t tend to get sick. 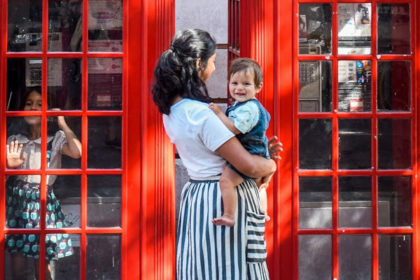 We also know by this point that our babies tend to not be super prone to sickness, so we feel comfortable traveling pretty young, but you may decide differently based on your circumstances. And that’s okay. What mode of transportation will you use to travel with a baby? Especially during flu season, are you comfortable having your baby in an enclosed airplane? Or would you prefer to be in your own vehicle? There are lots of options for travel, both near and far. Some babies hate their car seats but pass right out in an airplane bassinet. Others sleep like a dream in the car, and can ride for hours. It’s worth figuring out what makes both you and your baby comfortable. Do I feel comfortable traveling with an infant? Finally, consider your own comfort level. Are you okay being flexible with the baby’s routine at that age? Are you willing to learn on the go while in an unfamiliar location? Is traveling with an infant likely to stress you out? Do you feel comfortable trying to communicate needs in a different language, and will you advocate for your baby if needed in a new locale? Do you panic when things don’t go according to plan, or are you good at going with the flow? Consider your own level of flexibility and adaptability before committing to something big. Regardless of what you end up doing, I would recommend waiting at least until after the baby is born to fully commit to any travel. Even if it’s not your first, you never know what will happen with the delivery, with breastfeeding, with illness, or a myriad of other issues. It’s always best to make an informed decision. With all that in mind, for the most part, our babies have been ready for more extensive travel by about 6 weeks to 2 months. We took our 4th baby to Paris when he was almost exactly 2 months old, and he was a great travel buddy. We took our oldest to Southern Africa when he was only 4 months old – that felt like it took much more planning and preparation, but it was absolutely doable and we’re so glad we made it work. But ultimately, every family is different. I hope these tips help you figure out what works for you! What do you think? Are there other factors you consider when deciding when to travel with a baby?